Visit Iceland in the summer months, the perfect season to sight humpback whales, orcas, dolphins. Discover Heimaey Island, the Pompei of the North. 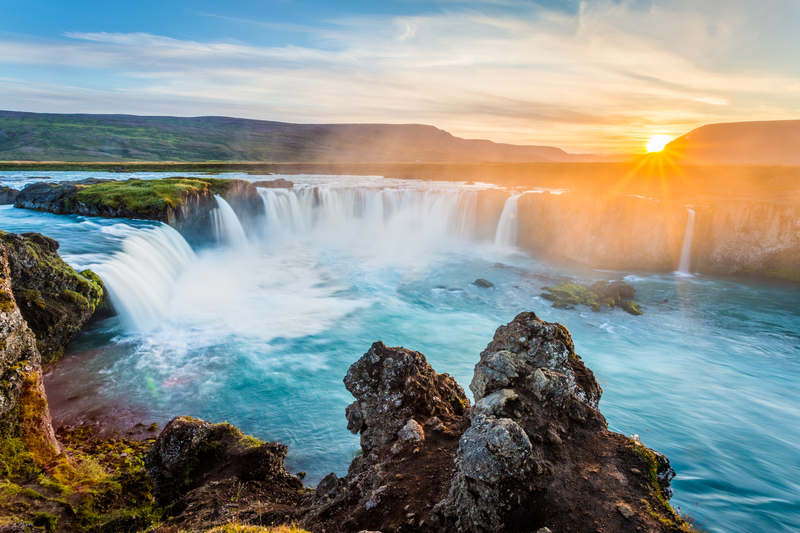 The Myvatn Lake, the Namarskard a striking geothermal field, and the Godafoss Waterfall. The quaint fishing village of Husavik. Siglufjordur a fishing town close to the Arctic cirle. Isasfjordur, and nearby Arnardalur Valley. Lower Deck 1 Double Bed Cabin The Category C cabins are located on the Lower Deck and have portholes. The cabins are air-conditioned and fitted with TV, telephone, hairdryers, mini-fridge, central music, and public address system and safe boxes. The fully equiped bathrooms are finished with marble. Lower Deck 2 Lower Beds or 1 Double Bed Cabin The Category B cabins are located on the Lower Deck and have portholes. The cabins are air-conditioned and fitted with TV, telephone, hairdryers, mini-fridge, central music, and public address system and safe boxes. The fully equiped bathrooms are finished with marble. Upper Deck or Main Deck 2 Lower Beds or 1 Double Bed Cabin The Category A cabins are located on the Upper Deck or on the Main Deck and have large windows enabling a breathtaking view or the areas you are cruising in. The cabins are air-conditioned and fitted with TV, telephone, hairdryers, mini-fridge, central music, and public address system and safe boxes. The fully equiped bathrooms are finished with marble. 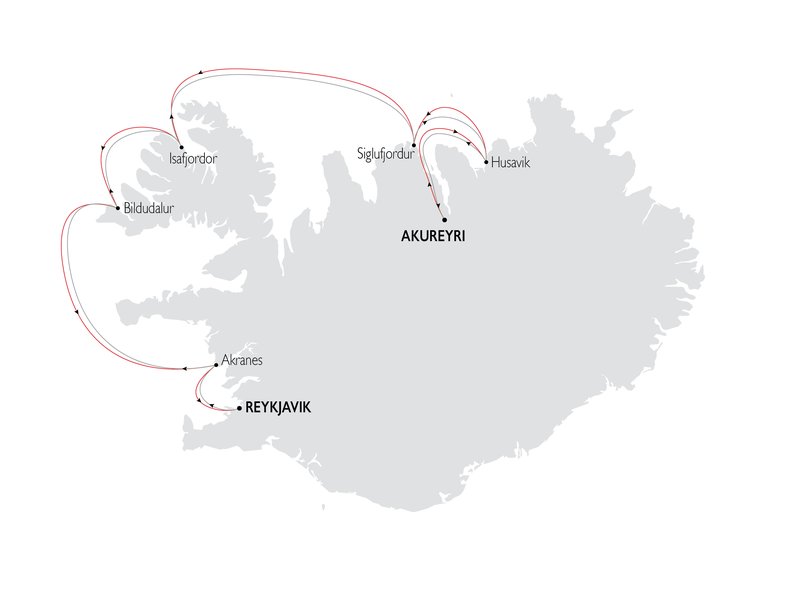 All day optional excursions in Reykjavik.Overnight in port. This morning we reach Siglufjordur, Iceland's northernmost city, very close to the arctic circle and possibly the most picturesque port of Iceland. Once known as the capital of herring fishing. The optional walking tour through the city will take you to the port, the herring museum, the folk music center housed in Madame house, the oldest house in the city. After lunch we leave for nearby Husavik port. Late in the afternoon we sail in the Skjafandi Bay and reach Husavik, Europe's capital of whale watching. We will have time to stroll around this charming fishing village and visit the wooden church, the best preserved church in Iceland. Overnight in port. This morning our full day optional excursion will take you from Husavik to Akureyri (where you will meet the Callisto in the evening). You will visit the lake Myvatn, namarksard and dimmuborgir, all fine examples of the volcanic world with lava fields, boiling and steaming mud pools, steam vents and craters. After lunch we continue on the ring road to reach Godafoss waterfall - the falls of the gods - and will hear about the kristni saga, recounting the arrival of Christianity and the end of paganism. We rejoin the Callisto in Akureyri the capital of northern Iceland and we will spend some time walking around this colorful city visiting in particular the art alley. Overnight in port. Itineraries can be changed at the discretion of the Vessel's Captain in case of adverse weatherconditions - winds of 6/7 beaufort or more depending on the vessel- on port authorities not allowing a vessel to leaveport or in case of other extraordinary conditions. 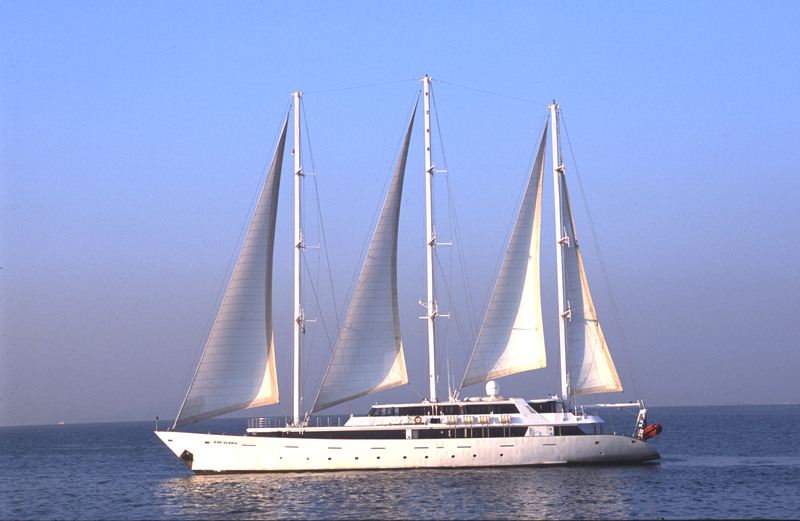 Vessel Type: Luxury Yacht Length: 54 metres Passenger Capacity: 49 Built / refurbished: 1993 / 2009 Discover a 3 masted sail cruiser which can accommodate up to 49 passengers in 25 cabins. The Panorama was launched in 1993 and was renovated in 2009. This state of the art sail cruiser has performed several Atlantic Ocean crossings and has sailed from the Seychelles to Monte Carlo and from the Black Sea to Tunis and offers the highest standard of accommodation and comfort safety. 10% EARLY BOOKING DISCOUNT TO ALL RESERVATIONS MADE UNTIL JANUARY 31, 2019 Prices online do not show the discounted rates. Terms and Conditions apply, special offer is subject to availability, please contact us for more details.